China's picturesque Kunming city, which is wooing Indian tourists, offers a host of scenic spots from sprawling lakes to rocky karsts, low-flying seagulls to high-rise infrastructure and centuries-old temples to bullet trains, all in India's neighbourhood. Known as 'the city of eternal spring' due to its spring-like weather across the year, Kunming, the capital city of China's most ethnically diverse Yunnan Province, is ideal to escape the tormenting summer and winter seasons, according to the tourism officials. The city's proximity to India -- just a two-and-a-half-hour flight from Kolkata and a four-hour flight from New Delhi -- rules out any possibility of a jet lag, a physiological condition globetrotters always look to avoid, the provincial officials said. China, one of the world's top receivers of international tourists, has been promoting Yunnan as a paradise for Indian travellers, including the middle-class, highlighting its dramatic landscape and breathtaking views, they said. The Yunnan Provincial Tourism Development Commission has signed an agreement with the Travel Agents Association of India and a convention 'Tourism Beyond Boundaries' was held here in which nearly 500 delegates from India explored the tourism opportunities between the province and India. In 2017, Yunnan received a total of 573 million domestic and foreign tourists, raking in a total revenue of 692.2 billion yuan (USD 101.1 billion), officials said. "Kunming is an unexplored tourism paradise in India's neighbourhood. Indians visiting abroad should visit the city and experience its unique landscape, awesome weather and picturesque tourists attractions," an official told the visiting journalists. Kunming is one of the most beautiful cities of China. It is also known as 'the flower city' as its unique weather conditions allow it to grow flowers across the year, the officials said. One can easily spot beautiful and fresh flowers alongside the roads everywhere in Kunming, making it a delightful treat to the eyes, they said. According to the provincial officials, Yunnan is one of the most advantageous provinces in China, blessed with abundant tourism resources and endowments, they said, adding that it has 26 nationalities as a whole. In a bid to enhance people-to-people exchanges between Kunming and India, "there are plans to launch more flights to Kolkata and other Indian cities to boost two-way flow of tourists," He Ligui, Director General, Department of Culture and Tourism of Yunnan Province said. According to Kunming-based tourist guide Maria, the city offers a host of scenic spots from sprawling lakes between mountains to rocky karsts, low-flying seagulls to high-rise infrastructure and centuries-old temples, buildings to high-speed trains, all in India's neighbourhood. Kunming's renowned tourist attractions include the Stone Forest a notable set of limestone formations in Shilin Yi Autonomous County; Dianchi Lake also known as Kunming Lake; Yuantong Temple - the most famous Buddhist temple in Kunming; Green lake park - an urban park in Kunming which comprises a group of four small sub-lakes linked by bridges in the traditional style among others, Maria said. The tourism officials said that the air quality in Kunming is excellent. It enjoys a very pleasant climate across the year as it is situated at an almost-tropical latitude but with a 6,600 feet altitude. Flower-growing is a major industry here largely because of its climate, they said. Kunming serves as a base to explore Yunnan province. It is well connected to the rest of the country by road, rail and air, they said. Kunming's two new high-speed rail lines connect it to Guangzhou port city and Shanghai, the country's biggest city and a global financial hub. It is also well connected with Beijing, Wuhan, Nanjing, Fuzhou and Xiamen cities, the officials said. The city's excellent weather along with clear and fresh air allow tourists to go for a bicycle ride which is available for about 20 yuan (USD 2.91 or Rs 200) a day. There are bike lanes along the edges of many major roads, they said. The Earth Forest, the Stone Forest in Kunming and the Colorful Sand Forest in Luliang are called "the Three Forests in Yunnan", they said. Daguan Pavilion, on the shore of Dianchi Lake facing the Western Hills on the other side of the lake, provides an all-embracing view of the vast Dianchi Lake and the peaks of the Western Mountains. The park is one of the most fascinating gardens in Kunming, the officials said. 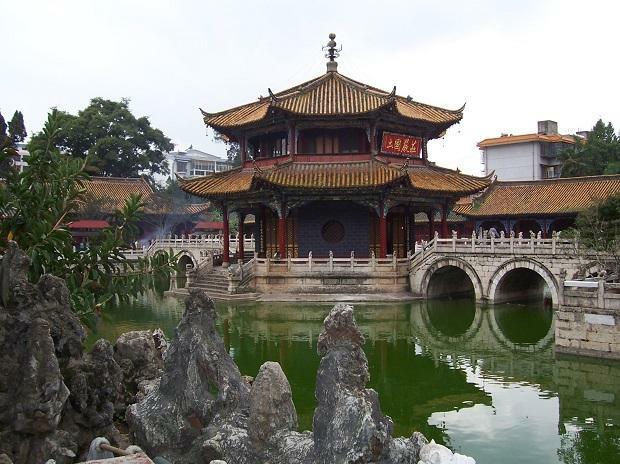 Yuantong Temple in Kunming has a history of more than 1,200 years. It is the most important Buddhist temple in Yunnan. Restorations works over the years have not changed the unique mixed architectural style of the Yuan and Ming Dynasties the temple is known for. There is a stone bridge in the center which connects the hall and the temple entrance. The pavilion of the temple is connected to the rest of the complex by various bridges and walkways, the officials said. Yuantong Temple attracts Buddhists from different parts of the country as well as from abroad. Many visit the temple on pilgrimages to pay homage. Kunming flower and bird market is famous for its varieties of cute little puppies, birds, flowers and tortoises. One can enjoy the company of countless flowers in various colours with pleasing aroma, the tourism officials added.